On 18 November 1873, the company founder, Wilhelm Pannkoke, is born in Luebeck, Germany, son of master carpenter Heinrich Pannkoke. The 15-year-old boy serves his glazier apprenticeship under glazier master Theodor Schroeder in Luebeck. After completing his apprenticeship, he leaves Luebeck and travels for eight years as a journeyman around Europe. During his travels he goes to Hamburg, Goettingen and Dresden in Germany, and then on to Budapest, Hungary and around the south of France. While still in Bordeaux, Wilhelm Pannkoke makes his first invention in 1900: the glass cutting apparatus, which is still sold today as the cutting slide. On the advice of the master glazier, he has his brilliant tool patented, takes production and sales into his own hands and founds his business for glazier tools and accessories in Berlin at the end of 1900. In 1905, he marries Dorothea Kuehl. Further inventions, such as the round and oval cutting machine and many others, follow. He registers more than 25 utility models that are used in schools for prospective glaziers. With these tools, his enterprise attains a world-wide reputation in the glazier field. American technical colleges are delighted with the cutting apparatus PANNKOKE. An American patent is granted. Son Karl is born on 16 August 1912. World War I takes its toll. Wilhelm Pannkoke is called to arms. His wife Dorothea has to run the business on her own. After the war, the product range is extended to include picture frames and a picture shop and the mail order business is started. One of the last inventions of Wilhelm Pannkoke is the glass blind for ventilation. He dies in 1941 in Berlin. At the end of the Second World War, his son, Karl Pannkoke, decides to start again in Luebeck, his father’s home town. Juggling with ration coupons of every kind, he starts work in a former air-raid bunker. 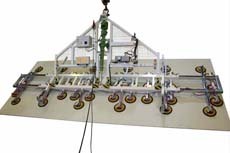 Under very difficult conditions, a panel pin machine and a lead drawing machine are constructed in order to stimulate the production of panel pins and glazier‘s lead. The manufacture of simple tools completes the product range. In 1949, Karl Pannkoke marries Margarete Ostwald. Margarete comes from an old established glazier family. Her grandfather was already a customer of the young entrepreneur Wilhelm Pannkoke. She herself had served a glazier apprenticeship and was familiar with the technicalities of the subject. From the beginning, Margarete takes over the business side of the company and contributes tirelessly to the success of the new company. At the 1st German Glazier Convention in Goslar, the new machinery is presented. The first company car, a DKW from 1936 with wooden chassis, is loaded up to travel from Glazier Convention to Glazier Convention to present the new machinery, to chat with customers and to pick up new ideas for further developments. Daughter Annegret is born in 1953. Due to his technically-oriented education, Karl Pannkoke is not satisfied with the production of only tools and glazier items. Like his father, he starts to convert his practical ideas into new products. The hand grinder, radius cutter, glass drilling stand, and brass mill are only a few of his progressive developments. At Glazier Conventions, he introduces his new machinery, talks shop with customers and obtains many of his ideas for further products. With the production of the first vacuum lifting device, the cornerstone of a future-oriented production field is laid in 1956. This first vacuum lifting device is sold to a glaziers' wholesaler in Gütersloh. Together with the French representative, Karl Pannkoke takes part in the Paris 'Journées Internationales de l’Equipement de Miroiterie', organised by Saint-Gobain. It is a major success even without exhibits, because they were released by the French customs only after the fair had finished. In the meantime, the bunker has become much too small and the company moves to a new production location in Haendelweg in Luebeck. Development is unstoppable. The first cutting tables and glass transport racks are designed. In the field of vacuum handling systems, the new Type JUNIOR for the construction site is introduced with a selling price of below DM 600.00. The UNIVERSAL type with separate vacuum pump is offered for the glass store. 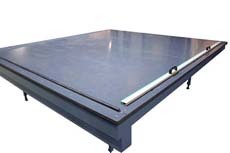 The first electric glass cutting table is used in Saarlouis, Germany. The first tilting cutting table was brought to the train station. 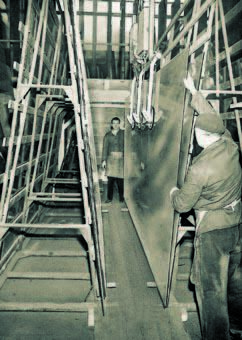 The first cutting device with several longitudinal and one cross cutting head is introduced at the German Glazier Convention in Hanover in 1964. 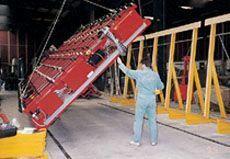 At the beginning of the Seventies, the air floatation tilt table, the loading frame and vacuum lifting devices for the manipulation and loading of large pieces of float glass are developed and sold. 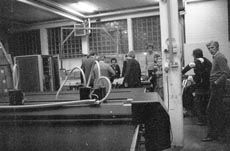 The first automatic loading table follows in 1974. Daughter Annegret Pannkoke joins the family enterprise in the commercial section in 1974. She takes over the personnel department, controlling and advertising and introduces a modern computer system. 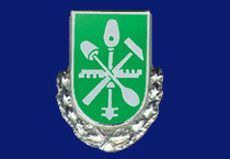 On the occasion of the company’s 75th anniversary, Karl Pannkoke receives the silver badge of honour for his contribution to the glazier’s craft. The first 2-bridged cutting machine is produced and sold. From Australia, Pannkoke receives a large order for 13 loading-cutting-systems. Shipment is made in RORO service halfway around the world. The container service is still in its infancy. Expansion and new challenges necessitate changes to the private company. The company Karl Pannkoke becomes Pannkoke Flachglastechnik GmbH. The children, Annegret and Bernd Pannkoke, and employees Holger Kramp, Ulrich Wulf and Jörg-Joachim Jacobs become partners in the company. The software company H+O of Hamburg programs the first cutting optimisation system for Pannkoke on an Olivetti P6060. The fully automatic multiple cutting-head machine NC-78 was introduced at the Glas’78. Glas Funke in Gemünd receives the first fully automated multiple cutting-head machine NC -78. In 1982, the CNC multiple cutting-head machine is replaced by the single cutting-head machine. 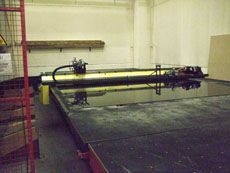 The first laminated glass cutting machine goes into operation. Holger Kramp leaves the company for personal reasons. A further production hall is built in Haendelweg. After his electrical engineering studies in Luebeck, Bernd Pannkoke acquires further practical experience at Siemens in Munich. In 1988, he also joins the management of the company and takes over the technical department. 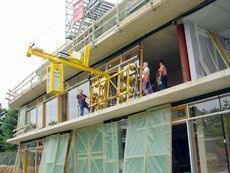 The new generation of vacuum lifting devices for hall construction comes onto the market in 1988. With this type of device, it is possible to install insulating panels up to a length of 12 m.
A battery-operated vacuum lifting device is developed to transport steel plates weighing up to 5000 kg for the shipbuilding industry. Following the reunification of Germany, everyone is focussed on further German unity. Even in the early years of unity, Pannkoke sets us marketing stations in Dessau and Dresden. The new generation of NC cutting machines is presented at the Glastec '90. The operating software with the cutting plan editor is developed by Hanic, Gelsenkirchen. Vacuum handling technology is a special challenge for son Bernd just as it had been for his father. He has his own ideas and experience and he works out a new modular system for the vacuum handling technology. In 1991, Bernd Pannkoke is appointed managing director. The first glass cutting processing line with automatic traverse break-out section for production of automotive glass goes into operation. On an area of 100 m², approx. 250 m² of glass is cut per hour, corresponding to roughly 700 primitives. After a lifetime spent in the service of the glazier‘s trade, Karl Pannkoke, founder of the production sectors of vacuum handling and glass cutting technology, died on 5 September 1993 at the age of 81. Since the beginning of vacuum handling technology, it had been his special favourite, and not only in the glass field, but also in other production sectors where gas-tight materials were used. Through his initiative, the vacuum handling devices, originally seen as just a sideline of the cutting technology, came to be one of the more important Pannkoke products. 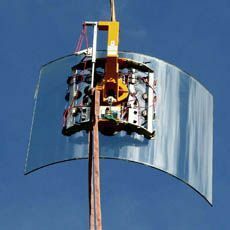 In 1994, Pannkoke constructed a vacuum lifting device for the installation of a shop window for a Japanese customer. This gigantic pane is 12 x 3 m, has a glass thickness of 22 mm and a weight of 2,000 kg. This application was so unique that it was shown in every Japanese news programme. The Asian flat glass industry ordered several vacuum lifting devices for tilting. The largest devices were designed for a glass size of 12 x 3m and a thickness of 25 mm. The new generation of NC machinery with user-friendly operation, direct measuring system and digital servo drive systems and components was designed specially for efficient cutting in glass grinding factories. On a surface area of 120 square metres, Pannkoke installed the first laminated safety glass cutting processing line for glass sizes of 6.00 x 3.21m with automated loading and access to six different glass types. There was an exhibition of Pannkoke tools and vacuum lifting devices from the past 100 years at the glasstec 2000. The trade fair was also the venue for the launch of the first 2 circuits vacuum lifting devices compliant with the latest safety requirements. During its many years of experience, Pannkoke has distinguished itself as a leader in fulfilling extraordinary customer wishes and requirements in respect to vacuum lifting device needs. Quality and service always come first. Already during construction, special attention is given to promoting the long life of the products. The name of Pannkoke Flachglastechnik GmbH therefore stands for the highest quality and customized services even into this century. How do you move window elements up to 1200 kg in weight under an overhang of up to 1.5 metres? 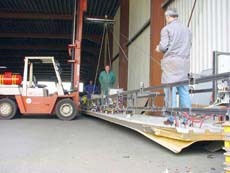 In 2001, this customer request gave rise to the first vacuum lifting device with a counterweight unit. This was the year the “BALANCE” device was born. Every new order brings new requirements demanding a solution. 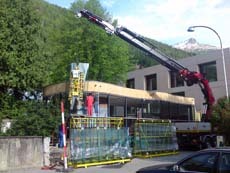 Using a 2 circuits vacuum lifting device 7201-HVSO, we placed a 60 m² single-piece curtain-wall in the construction. The most difficult part of this assignment was raising the 2,800 kg curtain walling elements from the ground. Glasstec 2004 sees the launch of the 2 circuits vacuum lifting device 7211-DS3. This is the first vacuum lifting device in the world that can turn and swivel 1000 kg on an EC construction site. It also complies with the requirements of the new safety standard EN 13155. 9 m long pane of insulating glass with Pannkoke special vacuum lifting device. 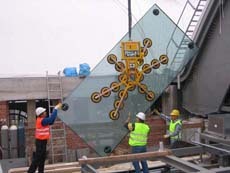 This signalled the use of new glass sizes requiring vacuum lifting devices of the right size. The 2-circuits technology doesn’t stop at the “BALANCE” counterweight unit. In 2005, numerous different window elements with blinds are installed in the hospital in Würzburg with the specialised vacuum lifting device. The first vacuum lifting devices for production of glass lengths up to 12 metres were shipped in Germany. 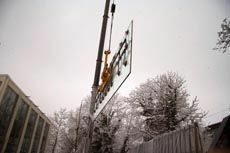 In 2006, the first almost 9 m long pane of insulating glass was installed using a Pannkoke vacuum lifting device in the Jewellery Museum in Pforzheim under wintry conditions. 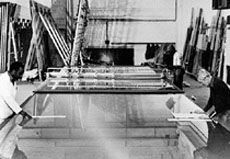 Decades before, like for the construction of the jewellery museum which took place at that time, large panes were positioned using two Pannkoke vacuum lifters. Margarete Pannkoke steps down from the senior management team. 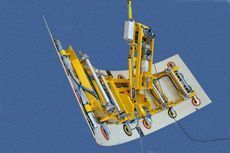 Several vacuum lifting devices with 2-circuits technology for curved glass panes with a minimum radius of 700 mm are delivered. Seele in Gersthofen receives several special vacuum devices for glass staircase production from Luebeck, including the Kombi 7031-DS3 for turning and tilting weights up to 1000 kg. A large order was accepted from a German plant manufacturer for air-floatation tables for use in producing solar elements. 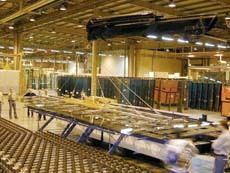 Newly founded Energy Glas was fully equipped with vacuum lifters from Luebeck. How can heavy weights be pivoted? We support manufacturing at Sedak with two large swing vacuum lifting devices. We construction them in accordance with many special requests. 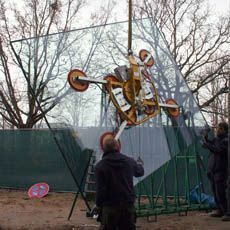 The glass panes which weigh up to 2500 kg and are up to 12 m long can be precisely moved with the electro-cylinder. The first Kombi DS3 with 4-circuit technology is presented at Glasstec 2010. It is exactly the right product for the Swiss company Ruch and will be acquired by them directly from the fair. Jörg-Joachim Jacobs leaves the company for personal reasons. We thank him for his loyal and dedicated cooperation over the years. Lindner buys two fully operational vacuum lifting devices to move the curtain walling elements to the new terminal of the airport in London. The different elements can increase in size from 80 cm to up to 3 m wide, and from 2 m to 9 m for the length. All of this is moved with only one vacuum lifting device. Additionally, assembly using a protrusion is required, which is why the vacuum lifting devices are additionally equipped with a counterweight unit. The 7411-DS7 vacuum lifting device is presented for the first time at Glasstec 2012. Finally, a small vacuum lifting device which is able to lift up to 750 kg at EC construction sites with its four extensions. Ulrich Wulf leaves the company due to age reasons. We thank him for the decades of loyal and committed cooperation. The Kombi 7411-DSG7 vacuum lifting device for bent glass panes can show what it is capable of. It passed its first practical test. 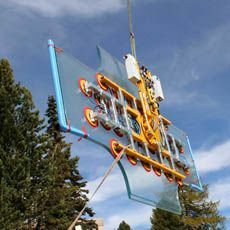 Heavy, bent glass panes weighing up to 750 kg can be moved this vacuum lifting device, including convex and concave panes with a minimum radius of 750 mm. Margarete Pannkoke died at the start of the year after a long illness. 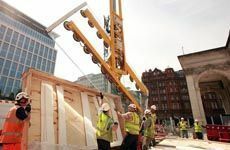 Lindner in Manchester requires a particularly flat vacuum lifting device to move bent glass walls for a special construction. We were also able to develop and manufacture this vacuum lifting device. Swiss company Ruch require a vacuum lifting device for a special purpose, which can move special, 2000 kg glass plates up to 2000 m high. This is no problem for the Kombi 7441-DmS6H which has been specially designed for this task, and it could also be used at a height of up to 3000 m with no problems. We produce a special vacuum lifting device which is 6 m long glass panes for SGGS Döring in Berlin, which can move convex and concave glass panes with a weight of up to 1400 kg. We received a large order for several vacuum lifting devices which can lift up to 1700 kg from Hevron in Switzerland.